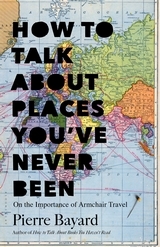 In a review of a sequel to Pierre Bayard's earlier How to Talk About Books You Haven't Read, How to Talk About Places You've Never Been ("Broadening the Mind," TLS, 6/17/16) Ian Ransom quotes the French author and academic thusly, "if you want to be able to talk about a place, the best thing to do is to stay at home." Ransom takes umbrage at a quote from the earlier volume, "It is sometimes easier to do justice to a book if you haven't read it in its entirety--or even opened it" by warning TLS readers to "ignore him." But without reading either of the books (something which would probably make Bayard a little happier than his publisher) couldn't it be surmised that what Bayard is talking about is imaginative space. The obvious advice one might have given Franz Kafka was to visit America before he wrote Amerika. Though it might have been a little harder to do, the same can be said about King Arthur's Court in reference to Mark Twain's Connecticut Yankee. It's precisely the argument made by those who don't believe that a white Elizabethan could have written a play about a Moor. The demand that writers only deal with what they know is limiting. Who's to say that visiting a place or being member of a particular race makes you more qualified to know it? But let's say it did and a law was passed stopping anyone from talking about those things that they haven't experienced. Wouldn't that eliminate one of the most pregnant sources of observation and something which has motivated both writers and explorers since the beginning of recorded history, the fantasizing that accompanies the anticipation of what a place is like or a person, one has never met, might be? There would be no more blind dates.